Contemporary artist Mark Bradford’s new sculpture—the 20th addition to UC San Diego’s Stuart Collection— is a monumental ode to the origins of today’s lightning-speed communications. Photo by Erika Johnson/UC San Diego Communications. Want to see the sculptures for yourself? Visit stuartcollection.ucsd.edu to learn more about each artist and work, and download a map for a self-guided tour. The Stuart Collection relies on philanthropy to bring new sculptures to life. To learn more about how to help support, contact Mary Beebe at mbeebe@ucsd.edu or call 858-534-2117. 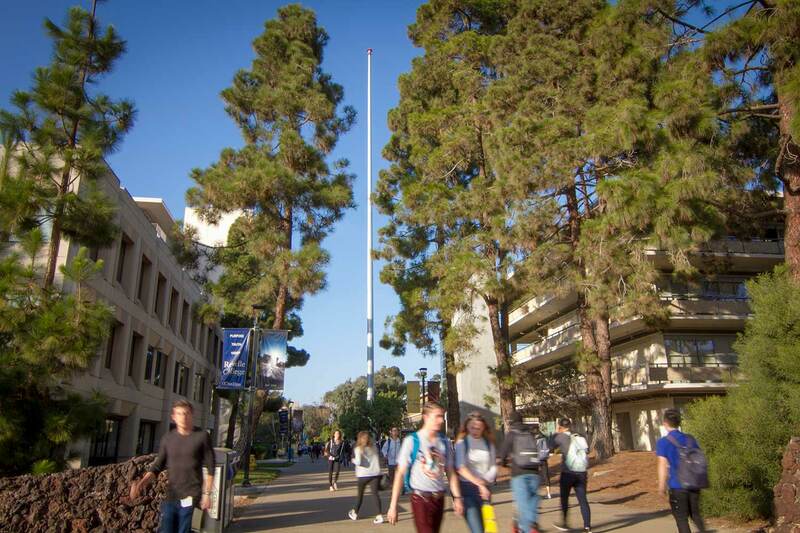 At 195-feet-tall, it is the tallest structure on campus. Contemporary artist Mark Bradford’s new sculpture is a monumental ode to the origins of today’s lightning-speed communications. It is the 20th addition to UC San Diego’s renowned Stuart Collection, a unique collection of site-specific works by leading artists of our time. His work is soon to be followed by two more pieces, including a mural by Alexis Smith and a sensory environment by Ann Hamilton. The sculpture, titled WHAT HATH GOD WROUGHT, is intended to reflect on the powerful influence of technology while silently referencing impending change. The campus and local community are invited to learn more about the piece from Bradford, who will speak at 6 p.m. on Dec. 1 in Galbraith Hall. 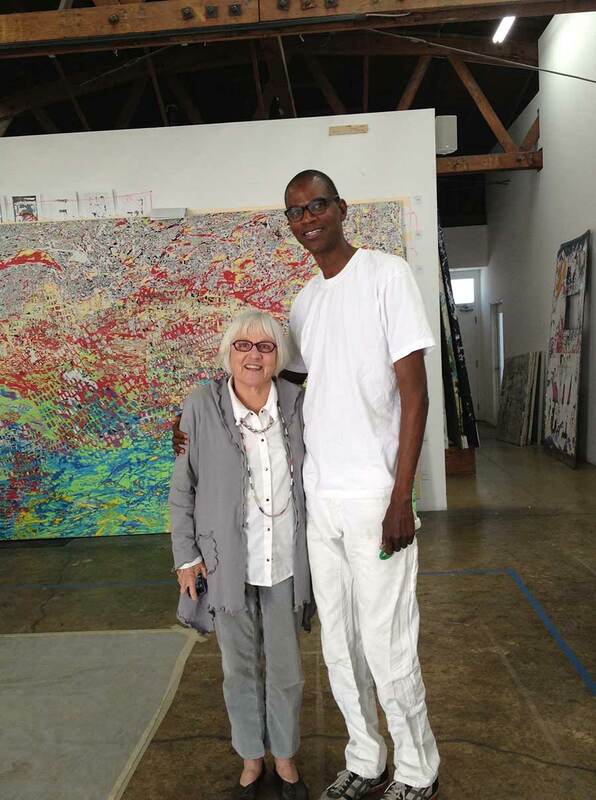 Stuart Collection Director Mary Beebe with artist Mark Bradford. Bradford was born in Los Angeles and is known for producing large-scale, abstract paintings and collages made from leftover artifacts from city spaces. He builds up layers of found materials, then cuts away at them, revealing a kind of map of urban life, networks and relationships. In 2009, he was awarded a MacArthur Fellowship, followed by a National Medal of Arts in 2015. Two years later, Bradford was selected to represent the United States at the Venice Biennale, a prestigious international art exhibition. She visited the campus in 2013 to talk about a proposal that involves a series of swings that will hang from the Pepper Canyon transit station trestle as well as a 400-foot embossed pathway that leads into the heart of the university. The passageway is envisioned as a concordance featuring hundreds of quotations from faculty members and other notable figures connected to the campus such as Thurgood Marshall and Eleanor Roosevelt. Running down the middle are intersections that the passages share. The work, still in development, will be the collection’s 22nd installation. All pieces in the Stuart Collection are site-specific, permanently built into the university’s landscape and architecture. Each sculpture is funded by private donations and must be approved by an advisory board—comprised of museum directors, artists, educators and community members—as well as the Chancellor’s Office. The process can take years, but the product is often notoriously bold.